Many of our customers come to us after a long and extensive search for the perfect home plan comes up empty. They have a dream to build a home, but no existing plan fits all their needs. With Custom Home Designs, there’s no need to compromise. You don’t have to build your home based on a plan that does not fully suit you, your family and your lifestyle. Why Have Custom Plans Drawn? Your home plan will fit you rather than you having to fit with an existing home plan. Your ideas will be incorporated into the building of your home. Whether you want a simple bungalow or a luxurious estate house, we will work with you to make it happen. You are unique, and each unique house plan will be customized to suit your needs and your individual home style preferences. We are not a house plan factory that churns out house plans with no specific homeowner in mind. We’ve had custom house plans built all around the world and each plan is unique and important to us. We offer a wide array of lifestyle features and amenities not found in many stock home plans. 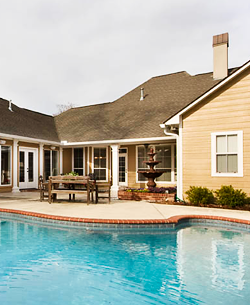 In addition, you’ll find that our pricing is competitive with other custom home plan services. We don’t charge based on the square footage of a home but rather on the time required to draft it. This means you’re truly paying for what you get and not an amount that has been predetermined by size. The homes we draft are designed to eliminate waste in structure and materials, so you’ll end up with money in your pocket that you can either save or spend on adding more exciting features to your home! We will include savings at every stage of construction. Your home will also be as energy efficient and structurally sound as possible and will meet or exceed all local codes. Custom Home Designs will make sure you have everything in hand to be in the best position with lenders, builders and permit offices. Complete plans and specifications are required by all lending institutions in order to have your new home appraised before a loan application can be processed. Complete plans and specifications will also allow you to get competitive bids from more than one builder. Detailed plans and specifications are required to get necessary permits.